Glories are often seen from aircraft. Get a seat opposite the sun and watch them ring the aircraft's shadow - or more accurately, where your own shadow would be. These rings are formed when light is scattered backwards by individual water droplets in the cloud. The more uniform the size of the cloud droplets, the more rings you will see. They swell and contract as you travel over clouds with smaller or larger droplets. 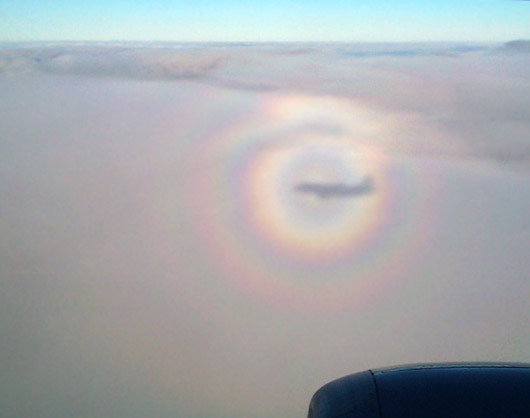 There are lots more interesting optical effects that can be seen from aircraft. Since I will be one of those holiday travelers I will not likely be adding entries to this weblog very frequently over the next few days until I return to work on the 29th. Happy Thanksgiving, everybody!